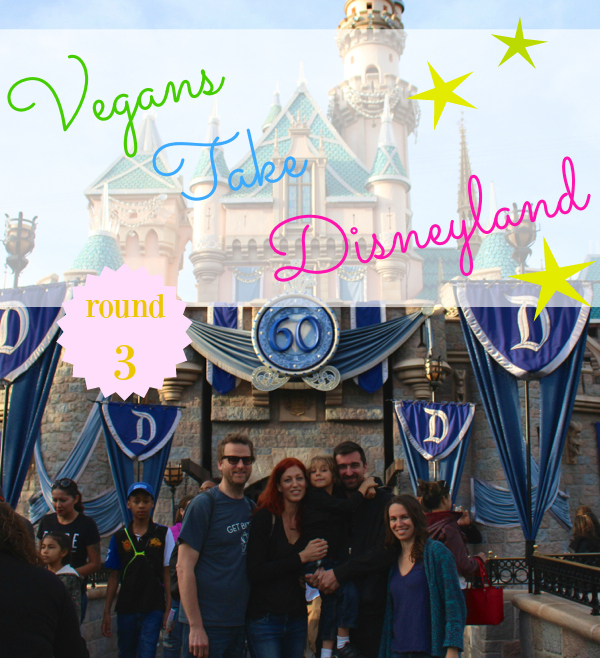 Our Annual Vegan Family Disneyland Adventure: Round 3! This March, for Waits’s sixth birthday (AHEM WHAT!!!?) 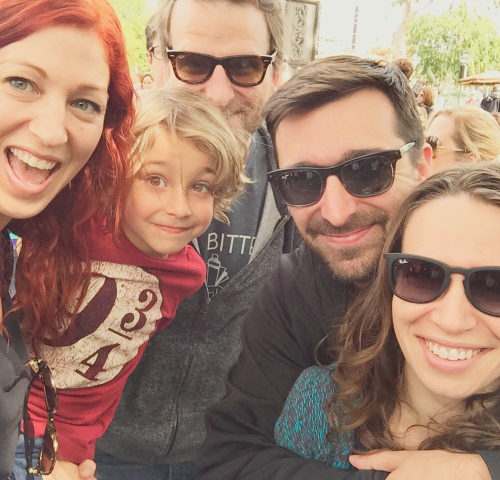 and for the third year in a row, our little vegan family went adventuring to worship at the altar of the Mouse. And this time, it wasn’t just Waits and Damian and I. No, we are a thoroughly modern family these days, and our little family has grown, and lucky wee Waits Rebhal is just completely surrounded by grown-ups who love him. And each other. 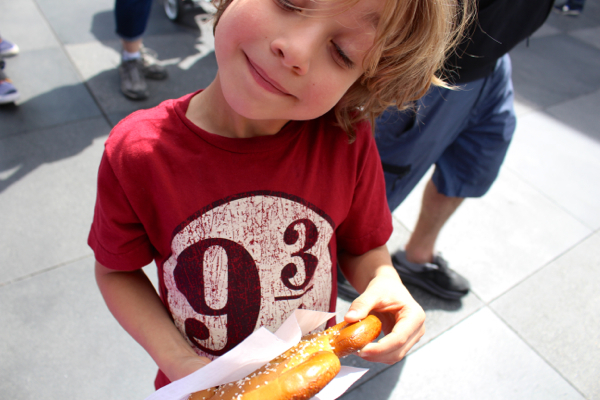 And would you believe that this was Jeremy’s very first Disneyland adventure, ever?? I know! 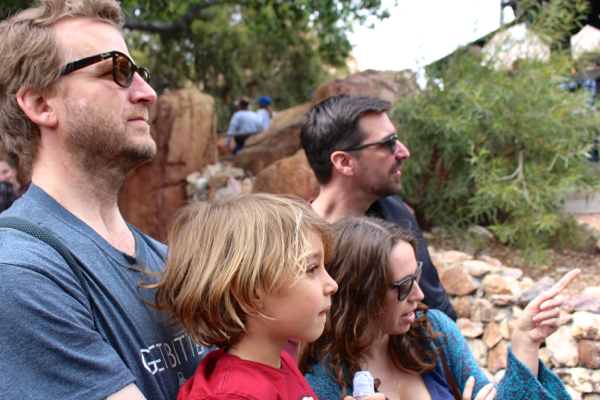 So for me, it was a double whammy of Disney glee: watching Waits bask in the absolute joy that is Disneyland-through-the-eyes-of-a-six-year-old, and also, finally sharing this incredibly nostalgic piece of my history with the man I love. 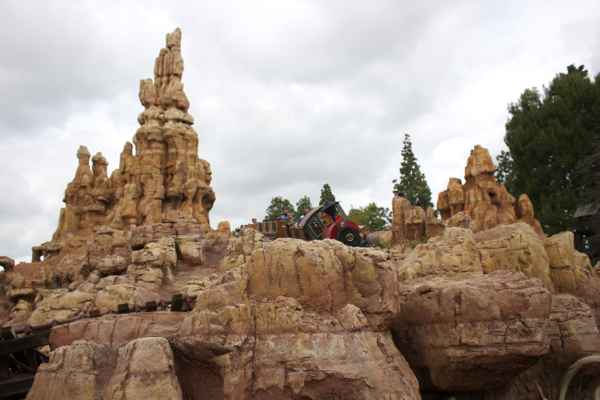 I grew up going to Disneyland and I have a memory for every inch of that theme park. 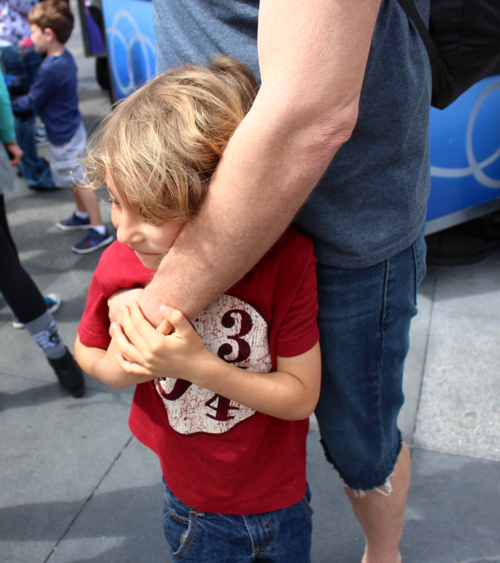 And getting to share all that with Jeremy — Pirates Of The Caribbean and The Haunted mansion and Star Tours and all the sights and sounds and fun — well that was just extra magical. And it was also such a treasure for us to get to share this day with Damian and Danielle. We see them pretty often, but always in the passing chaos and daily life. We hadn’t spent any real quality time with them since Christmas day, so it was really lovely, and of course always so special for Waits, that we were all able to be together. 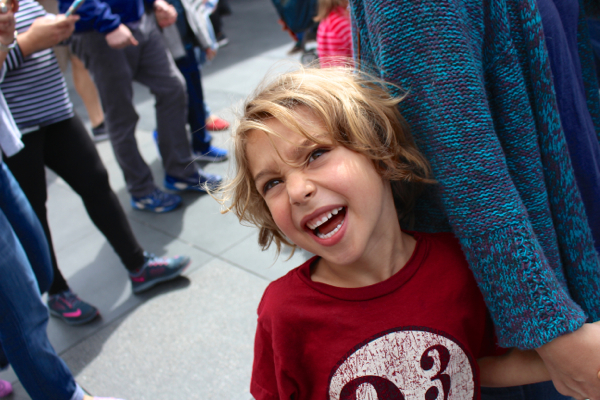 That kiddo had one heck of an adventure-filled, excitement-filled, and love-filled day! And I fully recognize that it’s something worth acknowledging. Worth stopping, and taking a breath, and feeling grateful. I am so thankful that we have achieved this happy, healthy, non-traditional-but-totally-functional, thoroughly modern family. So thankful. And, as always, we should talk about the food. 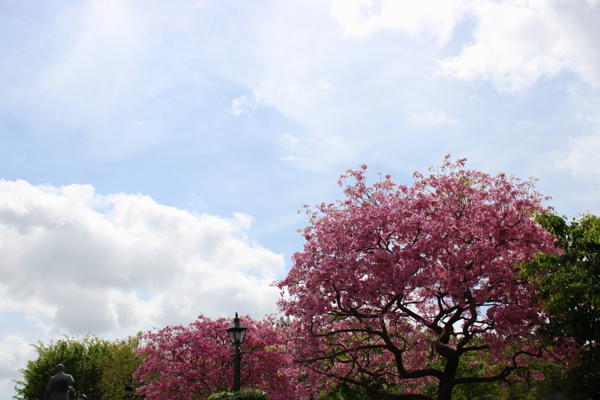 Being vegan at Disney is actually pretty easy (although being gluten-free vegan is considerably harder), and every year I learn a little bit more. 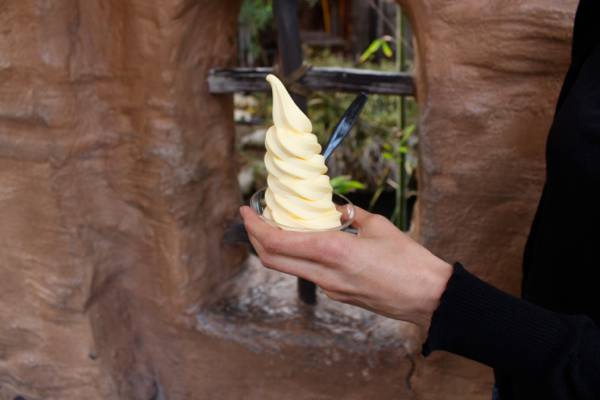 I think next year my goal will be to bring zero food along with us, and solely rely on the park’s offerings to provide us with our meals. But for this year, I took the easy way out and packed a back-up plan. We still ate plenty of park food mind you, because when in Rome. 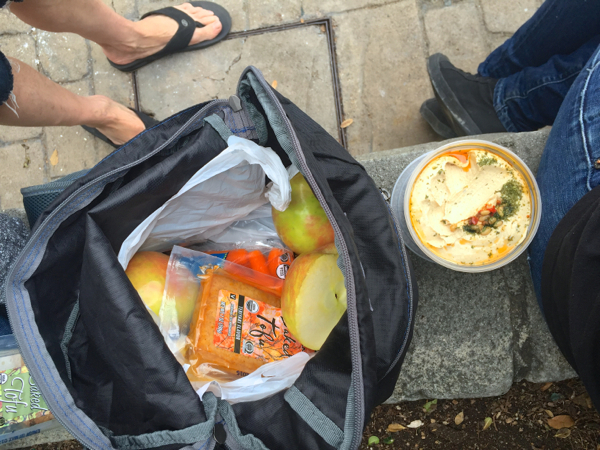 But I did bring the old stand-bys: hummus and crackers and carrot sticks and apples and Larabars. Oh, and I brought baked tofu. LOTS of baked tofu. But despite my healthy and wholesome snack-packing, we also managed to procure a selection of delectable vegan treats. As it should be. That got us through the afternoon with plenty of energy for adventuring! And Damian and Danielle finally tried some of the real “hot meal” vegan options: Vegetarian Gumbo in a sourdough bread bowl. “Accidentally vegan” and according to them, it was really good! 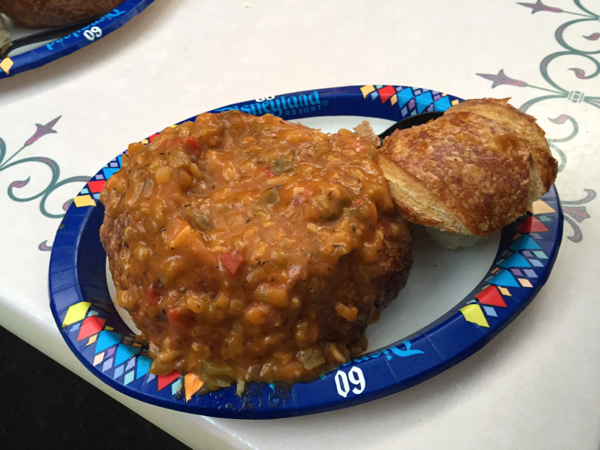 The truth is, Disneyland offers lots of hot food vegan – and even gluten-free vegan – options, like chili, and veggie/tofu skewers, and pancakes (gluten-free!) and more. I just mostly hate waiting in lines and paying out the nose for potentially-mediocre food. But next year? Next year I’m going to take the gamble. Mark my words! But really, that’s not what this trip is about. I couldn’t care less about what we’re eating, when it really comes down to it. 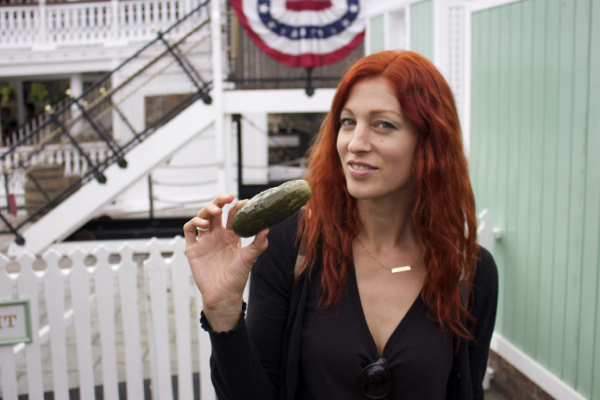 Because this annual adventure is so much more than a vegan food tour. And we are. And I am proud of us, for that. 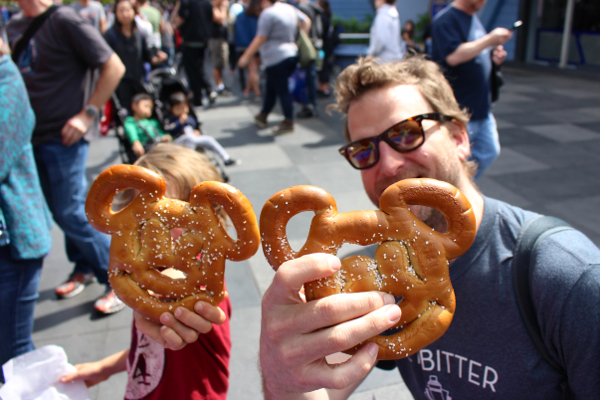 So cheers – to many more Disney years! This post made my cynical, Grinch-like heart grow three sizes larger :). Thank you! I love that you guys can all come together and provide a loving environment for Waits!! So awesome. It’s fine, I’m not crying. You’re crying. i loved this post so much. this sentence gave me the chills: “We’re still a family. It just looks different now.” i love your family and your outlook and dedication to your child. it is so heartwarming. Oh thank you Christa, I so love hearing from long-time readers! You’ll Instagram lots of pics, right?? Aww, yeah I was crying while writing it, haha. Glad you enjoyed it, Lacy! Aww thank you Lysette! It’s hard to make our way through this changing world, and families look so different than the “Nuclear Unit” they used to — and I think that’s a good thing! I’ve done a lot of reading and researching and just a lot of my own thinking, and I believe that these values are what children really need to thrive. Not “one mom and one dad” under the same roof”, but a cohesive story, and a supportive network, and an integrated group of loving parent-people. Its so amazing that you are all able to do – and enjoy – something like that together. Just goes to show how open-hearted you all are! I love the idea for taking the prebaked tofu out and about – I will have to try that! Gah this just about made me cry. Of course, that’s not such a hard thing to do since I had my son, lol. I love your little family being so open and close. But the main reason I’m commenting is because I’ve never heard of baked tofu and you seem quite taken. Tell us more? How incredible that Waits has and endless array of united love surrounding him at all times- he is one lucky little dude. Also, his shirt is fantastic! Love, love, love all the love from this post. I can feel it. Waits is a lucky guy.